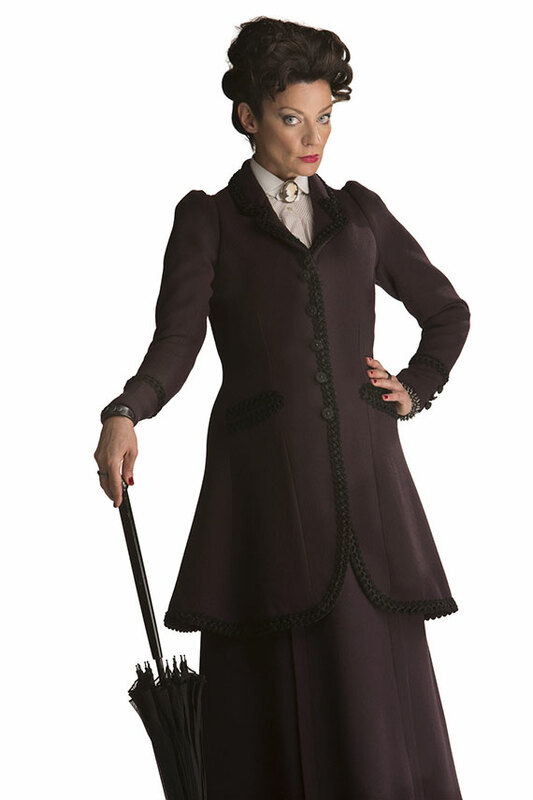 Missy, I couldn’t really call myself The Master, is my latest costume. 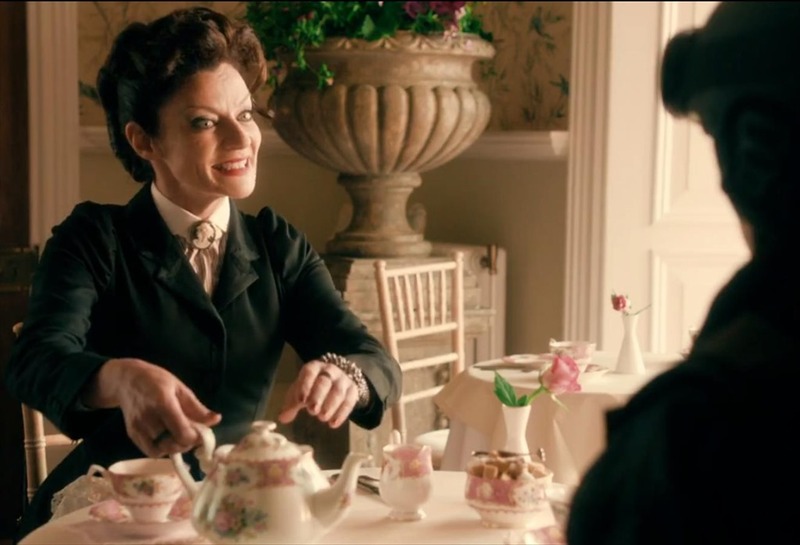 Missy has been a mysterious character all of Season 8’s Doctor Who. She is portrayed by Michelle Gomez. When word of her character was first announced, she was The Gatekeeper of the Nethersphere. In the early episodes of Season 8, we learned that she calls herself Missy as she greets the newly dead to Paradise, Heaven, etc. 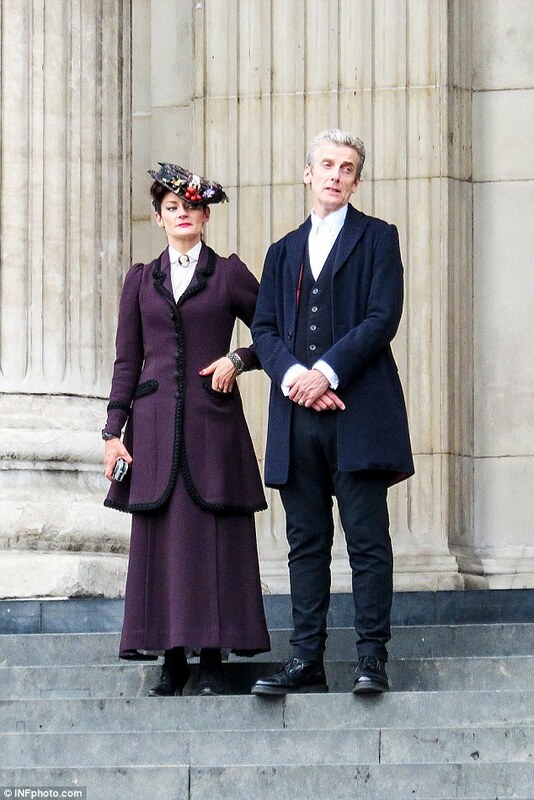 Missy is seen to be wearing two outfits. In the garden and tea room scenes, she is wearing a black suit. In Dark Water, she is wearing a purple suit trimmed in black cut to the same pattern. There is another scene in the hallway with Seb in which her suit appears brown, but it is probably just the lighting on her purple suit. I used Burda 7169 as the base of the coat (adjusting for screen accuracy – the jacket needs to be fitted and the bottom of the jacket is curved rather than straight) and Folkwear 232 as the skirt. The shirt is still in the works as I have discovered by viewing screen shots that her shirt in the black suit is a striped black and white rather than solid white. According to the screen images, she only wears the spiky bracelet but does wear several rings. 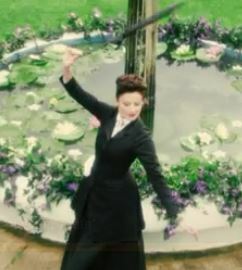 I also have a parasol frame that I will be recovering in black. I still need to find more accurate black trim for the collar and sleeves. 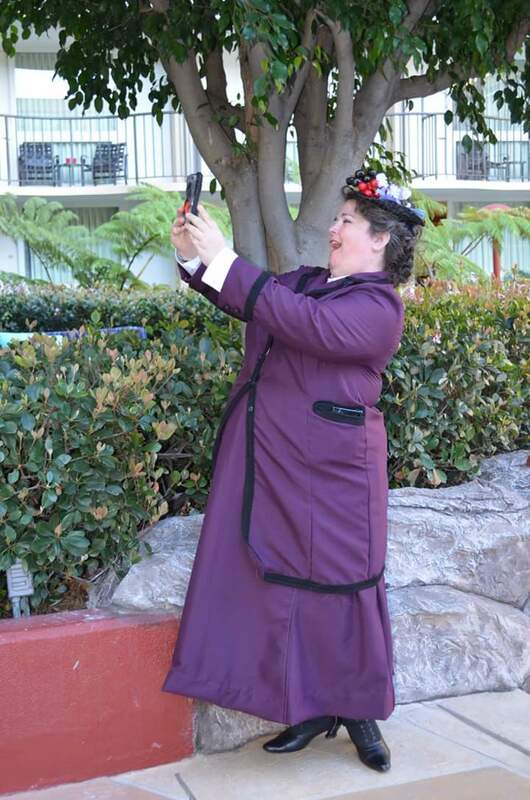 The Jacket – A purple, Edwardian coat with black trim around the pockets, sleeve cuffs and edges. The material should be wool or another suitable coating fabric. There should be 3 buttons on each cuff and 5 buttons to fasten the coat. 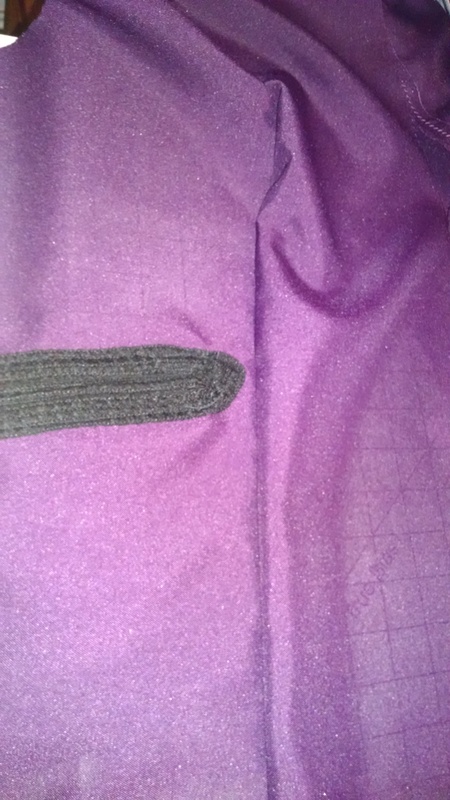 There is a kick pleat in the back of the jacket that when trim is added, appears to almost to the waist. I will be using Burda 7169, view B for the coat, adjusting the fit and curving the bottom of the jacket. Based on the fit of the muslin, View B will not need to be lengthened. The only major change is the addition of welted pockets, but those should be easy to add since the trim goes around each one. The buttons appear to be ornamental so the jacket is most likely held closed with snaps. This is one time that being fluffy has worked to my advantage. This pattern is almost perfect for Missy. Due to my short stature, I’ll only be placing 4 buttons along the front of her jacket. The Skirt – The skirt should be made of the same fabric as the coat. 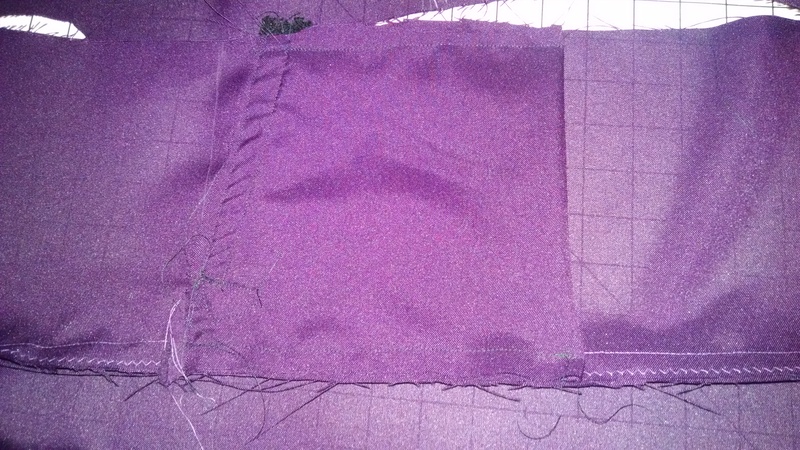 The skirt has 3 gores at the front with flat-felled seams sewn down about 1 inch down the front side gores. The length of the skirt should end several inches above the ankle. A simple white cotton or linen slip/petticoat can be seen under the skirt. I will be using Folkwear 232 for the skirt, making sure that the length is correct. This pattern has the correct number of gores in the front and that was my main concern. It also has the gentle flair that her skirt seems to have. The Blouse – Worn beneath Missy’s coat. Appears to be a white shirting with thin stripes along with a collar this has rounded tips. The sleeves should be long . The collar can also be done as a detachable rounded tip collar. Should be worn with a cameo. 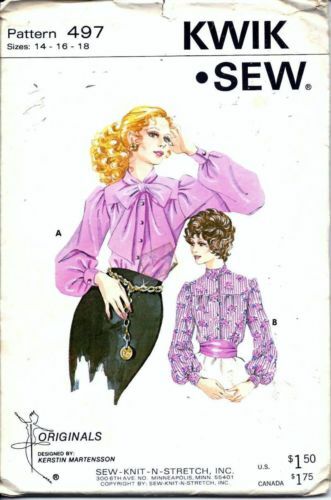 I will be using vintage Kwik Sew 497, view B for the blouse. The cuffs will be changed for accuracy, but this pattern has a yoke and gathers in the front. The pattern will need to be changed to reflect the pointed yoke in the back of the blouse. I will continue to be on the lookout for a more accurate blouse pattern in my size. Fellow Missy costumer, britgeekgrrl, was able to get high res images and has blouse fabric for sale at Spoonflower. I’ll be doing the blouse out of the SA fabric at a later date. 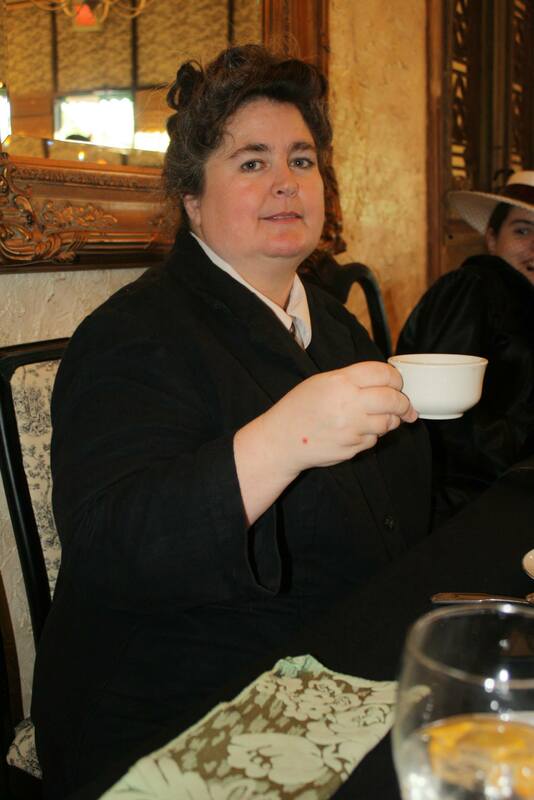 For Gallifrey One, I purchased a men’s dress shirt that had French cuffs and a banded collar. 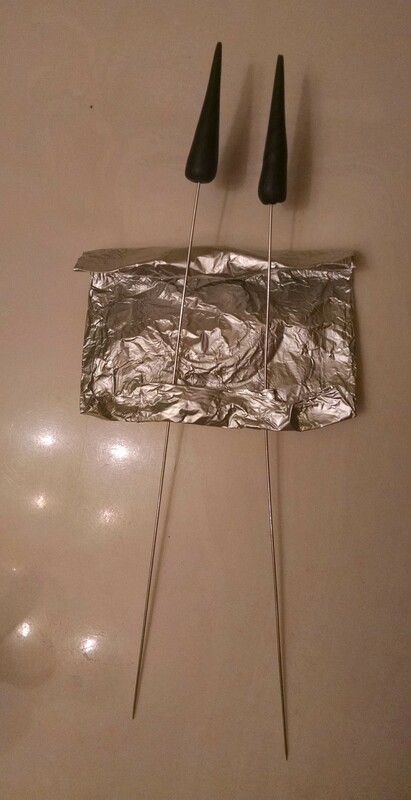 It worked beautifully. The Shoes – The boots should be Victorian mid-calf black boots with a Louis heel about 2-3 inches high. I will be using my go-to Victorian boots. 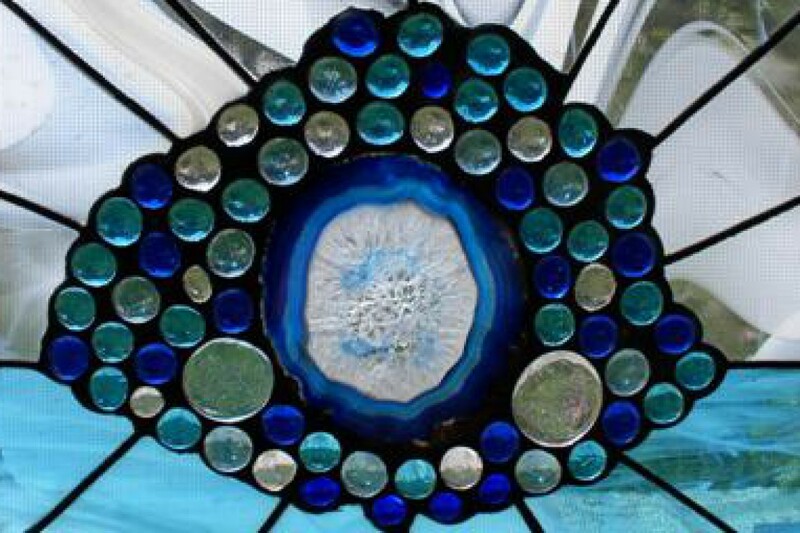 The Accessories – There are several accessories that can be added to enrich the costume. Cameo – Missy wears a cameo with both her purple and black suits. I had originally purchased an inexpensive cameo but decided it was not large enough, so I have purchased a larger, vintage cameo. I tried to locate a cameo that was left facing and found that task very difficult, so I found one that was within my budget but was right facing. 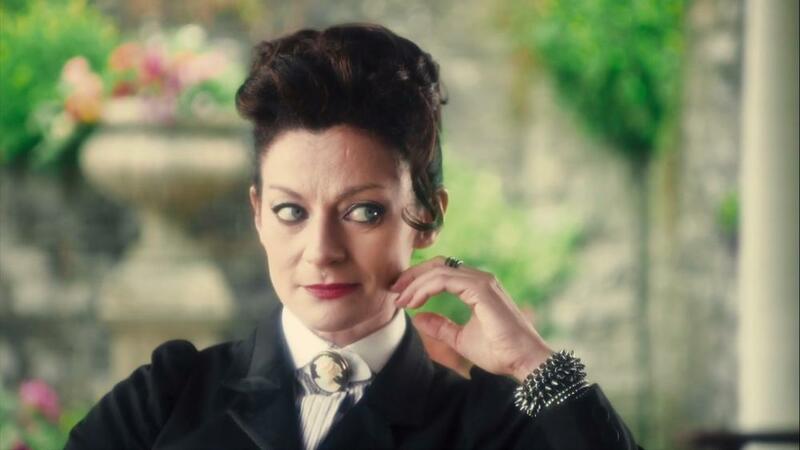 Rings – Missy wears rings on the middle fingers of both hands. I have purchased mens rings that have grooves engraved around the circumference. Bracelets – She is seen wearing two different kinds of bracelets. One is all spikes and the other is flush and has raised circles on the surface. 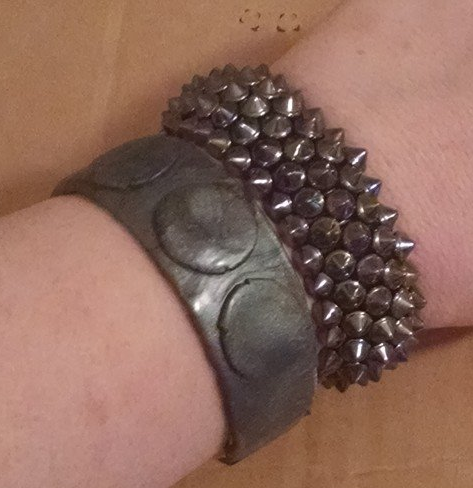 I purchased the spiky bracelet from an ebay seller. I actually purchased 2 since my wrists are large and I didn’t want elastic to cut my circulation off. The flush bracelet was a bracelet that I modified an existing bracelet. Link to my posting about this mod. Weapon – She also has a weapon that can be reproduced. The BBC has released its concept drawings of her weapon. 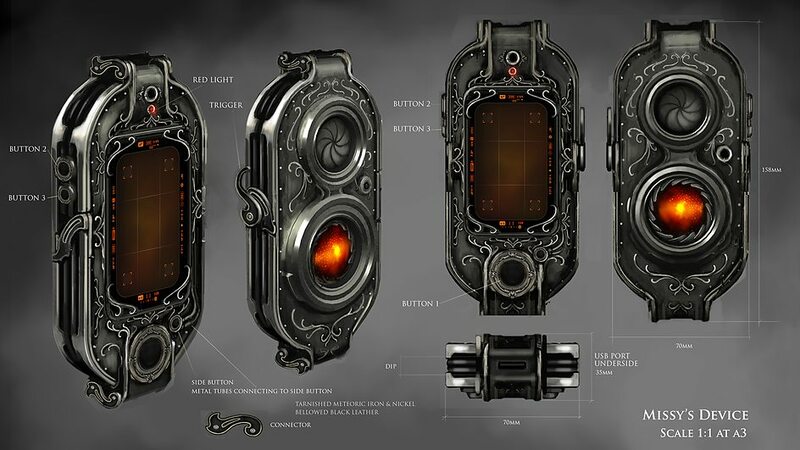 Having the concept drawings will make things a bit easier. Parasol – She has been seen to carry and twirl a black, Edwardian parasol. I have a vintage parasol that I will be recovering in black. Earrings – She does not wear earrings. Hat – She is seen to occasionally wear a small black straw hat, decorated with black and red cherries. 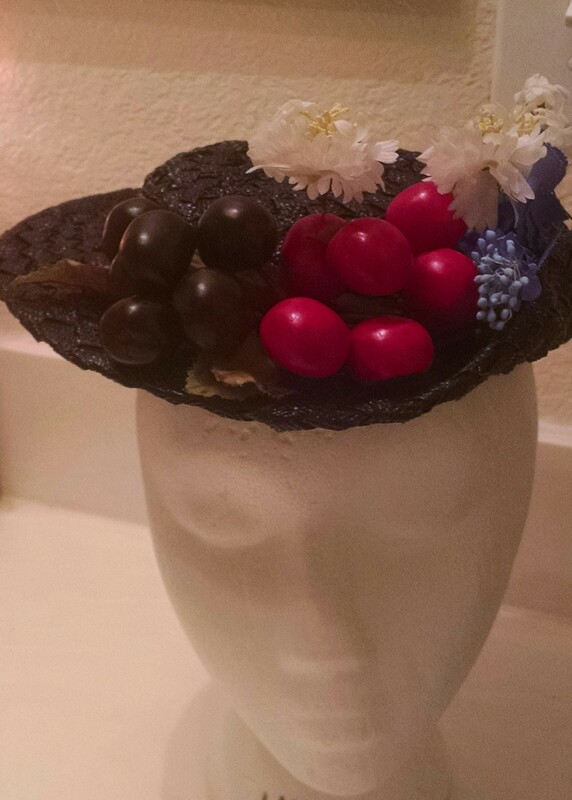 I have found a vintage black hat that I will be adding vintage cherries and flowers to. Hair & Makeup – Missy has an an updo that can be accomplished by using hair rats to increase the volume of the hair. There is also a wide braid or knot seen in the back of the updo. She has one curl that hangs down on the left side. Her makeup emphasizes her cheekbones and features eyeliner on both top and bottom lids, arched eyebrows and red lipstick. She also has red fingernail polish. Awesome! Thank you so much. This is full of great information for the Missy costume I’m making. I’m using Simplicity 1732 – didn’t see the Burda one till now – they are pretty similar. Again thank you. Sorry for the delay on thank you for your kind comments. If you’re not already a member of the Facebook Missy group, please join us! The Controller bracelet? I have one that was 3D printed but I’m not happy with it. If you’re in our Facebook Missy group, there is an interest thread from Kara to put it in her Shapeways account (Kara created the 3D files for the MPDA as well.